Gymboree celebrates childhood and creates quality clothes and accessories that are the fabric of childhood. They aim to inspire moms with their cute, colorful,coordinated collections. In Gymboree, kids shine bright and families look great together—for family moments, for special occasions, and for the special occasion that is every day of childhood. The good news is Gymboree is having a fantastic Labor Day sale! You can save 40% on EVERYTHING, and up to 70% off clearance! Head on over and get shopping for your kiddos. This is a fantastic time to go ahead and get clothes for the Fall, Winter, or Spring. Check it all out here. 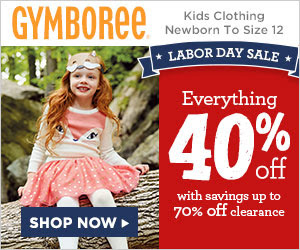 Offer: Labor Day Sale: Get 40% off everything at Gymboree, and up to 70% off clearance!